This is a fall / Thanksgiving / Turkey themed game or center. Students will find upper and/or lower case letters. This game is appropriate both for a school or homeschooled setting. This game is appropriate for preschool and kindergarten aged students, as well as, for special education instruction. This game gets kids up and moving and prepares them for "Write the Room" activities. I've included blank cards which can be used for students' names, sight words, etc. You can use the blank recording sheets to work with your customized cards. Objective: Students will search the room to find upper or lowercase letters. 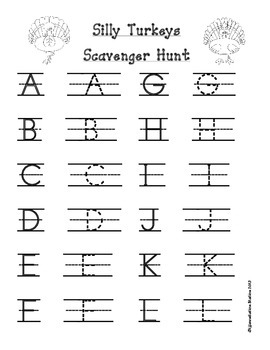 Students will trace or write the letter when they find the matching letter. 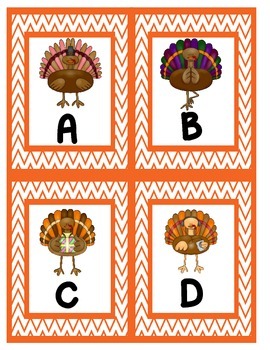 Students can use a swatter with a hole in it to catch the turkey’s letter. - Clipboards to hold recording sheets. (not included). -Choose upper or lowercase letters to tape to the wall. -Students will use a clipboard to hold the recording sheet. 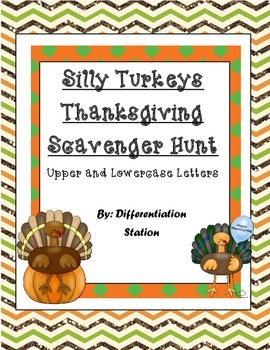 -Students will go on a scavenger hunt to catch the turkey’s letter. -Students will swat the letter with a fly swatter. -After students find the letter, students will either trace the same letter on their recording sheet, or write the same letter. -Students will identify and name the upper and lowercase letters of the alphabet. -I am including a blank recording sheet, so you will be able to choose specific letters for the students to work on. **Please leave feedback for my product. ** You earn credits for the feedback you leave on purchased resources! I am thrilled to receive your feedback, suggestions, and requests. I look forward to working with you! This product is the work of Differentiation Station. It is intended to support the implementation of the CCSS. No approval by, nor association with, the creators of the CCSS is intended or implied.